Now available on your Mac when you install the free upgrade to OSX Mavericks! Start up iBooks and visit the iBooks store. If you already purchased the book for your iPad, iPhone, or iPod Touch you do not need to buy it again. It should automatically appear in your library. Although the original color version is now "out of print", Mastering Cone 6 Glazes is still available in 2 formats. First is an eBook published on Apple products which can be found and bought through their iBooks app. Second, and more recent, is a black and white edition available from thebookpatch.com. Although the glaze photos are all grayscale in this new edition, we have put color versions right here on this website. Simply click on "Book Images" or "Glazes" here or in the drop down menu near the top of the page. For a more complete explanation of why we did this, click here. To see a detailed picture of the shoulder of the above sake jar, click here. We think you will be as amazed as we were. Do you want your glazes to be stable or durable in use and attractive? Do you want to be sure they will not leach significant quantities of metals into food or drink? This is the first book to address these questions in-depth. A wide variety of extensively tested glaze recipes are included as well as detailed guidance on formulating your own glazes. Do you want to be sure your glazes don't craze on coming out of the kiln or after extended use? Or perhaps you do want glazes that craze for a decorative effect. This is the only book that gives an in-depth discussion of how to prevent (or cause) crazing and the related problems of shivering and dunting. Do you want to know how you can test your glazes and pottery to be sure they are suitable for their intended use? A number of practical, inexpensive, in-studio tests are described that you may want to use. All of this information and more is explained in terms potters can readily understand. 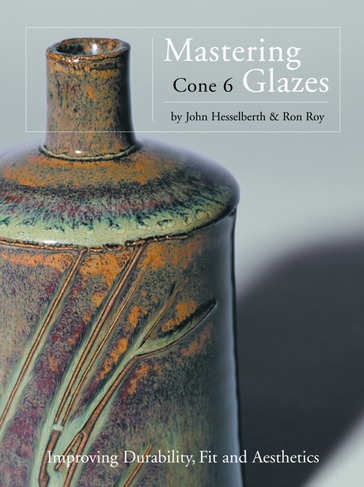 This is a ground-breaking book that studio potters, teachers of ceramics, students and others will find to be an invaluable source of useful reference information on cone 6 glazes.